Hey gang looks like I am just turning them out today!!!!! The hype train is still rolling on with Watchmen. 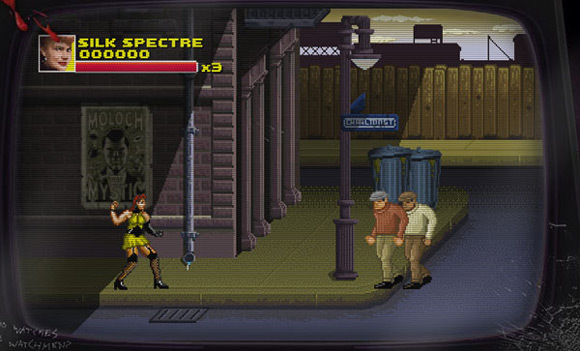 If you go to http://www.minutemenarcade.com/uk/ you will find a nifty little Old School 8 Bit (Double Dragon like) Watchmen game. It is pretty much what you would expect from a flash game so don’t go thinking it is “next gen”. It is a great work time waster for sure and it pays omage to some of video games finest hour the days of the NES. Click on the gallery below to see some pictures of the 8-Bit goodness you can expect.